Making your garden look nice can sometimes seem a bit daunting at first, especially if you have a big garden. People often try to forget about their garden because of the cost normally involved to fix i tup. Your garden should be somewhere that you can go and enjoy spending time in. To fix up your garden you don’t need to spend a lot of money on it, you can always DIY. This is why we have come up with 6 DIY jobs that you can do this summer to make your garden look great. Keep reading to find out more. If you have a shed, you probably already use it for storing all of your gardening equipment, old bikes or that barbecue that you never get around to using. One easy way of fixing up your garden is to transform your shed into something that you can make use of. This will not cost much money although you’ll need to clear it out and give it a good scrub. Why not turn it into a play area for your kids, a studio or even office space. Sprucing up your shed will have a great effect on your garden and will make it a more enjoyable place to be. Growing your own vegetables is a really easy and cheap way to both make your garden look better as well as feeding your family. You can grow things like tomatoes, broccoli or peppers in your garden which will add a lot of color. You will also feel great when you are able to make a meal out of the vegetables that you have grown yourself in your garden, just be careful to keep them safe from animals if you have any pets. You don’t need a huge space to grow these vegetables you can even grow some of them in pots, so you have no reason not to get started now! Take a look online at some of the best plants to grow in the climate of where you live. Adding fencing to your garden doesn’t have to be expensive and can make a huge difference to the overall look and feel of your garden. There are fencing companies like Buy Fencing Direct who offer cheap fence panels that you can buy to build yourself. This is a great way to add garden fencing especially if your garden is on a slope and you struggle to find fencing that will fit. This simple DIY job will involve you ordering some fence panels and putting them together – you can even spend some time decorating them if you want! This project will not only be easy, but it will also add a great new feature to your garden as well as extra privacy. Although you will need to pay for the lighting initially, this DIY task is a very simple and cost-effective way of sprucing up your garden. You don’t need to buy expensive lights, there are plenty of cheap ones available online. You don’t even need to worry about buying ones that don’t look great as there are lots of ways to make garden lighting look more attractive. When you complete this easy DIY task your garden will be lit up and it will look great on those summer evenings when you are sitting outside enjoying a glass of wine. If can be very expensive to buy nice garden furniture that is comfortable to sit on for long periods of time. This is where our next tip comes in. If you have a bench or a place to sit outdoors that isn’t comfortable, why don’t you customize it? This is as easy as buying a couple of cushions and blankets and adding them to your bench. You could even stretch for a foam pad that you could use on the seat to make it even more comfortable. Your new seating area will look great and you won’t feel guilty for spending loads of money on it! Although this tip may seem a bit weird, adding a mirror to your garden can do a lot for the light that reaches it. When you add a mirror to a small space, you can watch the light bounce off the sun and into your garden. 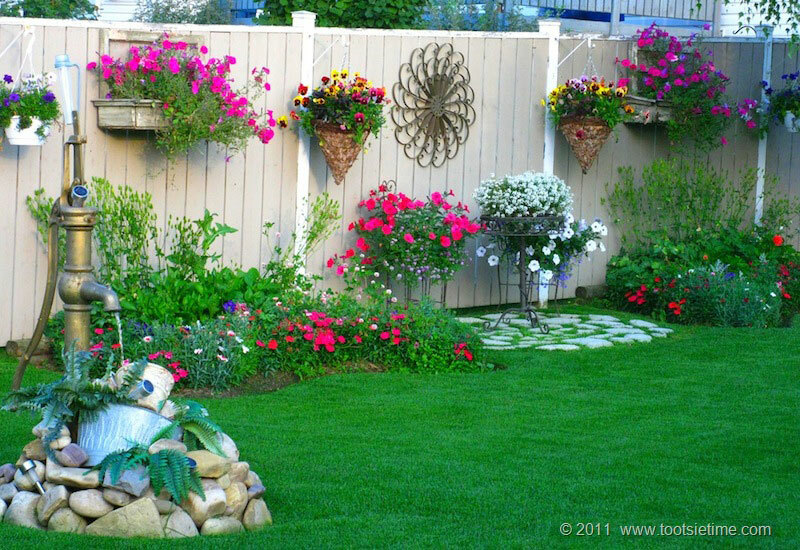 This is especially great if your garden is surrounded by high fences or trees. Adding a mirror will make your garden bright and enjoyable to spend time in. 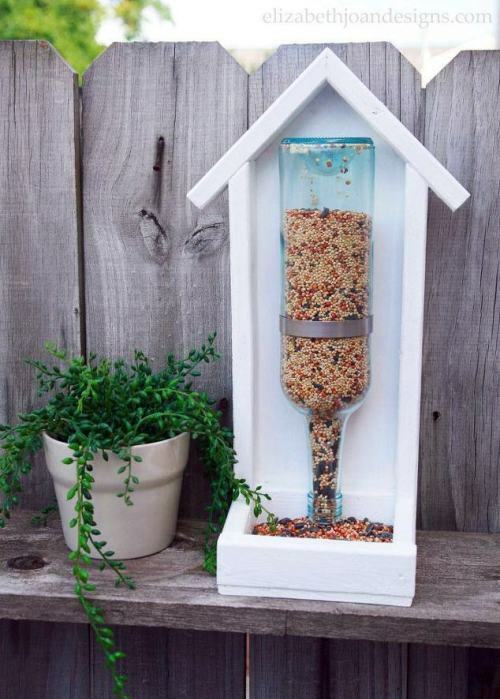 Our final DIY idea for you to try out in your garden today is to create your own bird-feeder. Bird-feeders can be expensive and often people don’t want to spend money on them and so miss out on having some beautiful birds in their garden. This problem is easily solved by making your own DIY bird-feeder. When it comes to this there are many ways that you can make this work whether you use an old plant pot for filling with food or simply hanging up an old mug or teacup. Get creative with this one and you could even involve your kids. This would be great as they would love to see the birds feeding from something that they helped to make! If you want to make your garden look great, you shouldn’t focus on spending lots of money on landscaping and other expensive items. There are plenty of DIY jobs that you can do to make your garden somewhere that you and your family love to spend time in. You can easily order materials online such as fence panels or new lighting to make it into a comfortable space. Try to get creative with these projects and think outside the box. You’ll find many other ideas and inspiration online of how people have transformed a plain, boring garden into something that you would dream of. Get out and get started now to make your garden great! I really hope you found these DIY Garden tips helpful, I can just see it all, and run with it let your own imaginations go crazy. Enjoy.